Nobody talks about these storms because almost nobody is living in these latitudes. And there is almost no navigation during this season in this region. 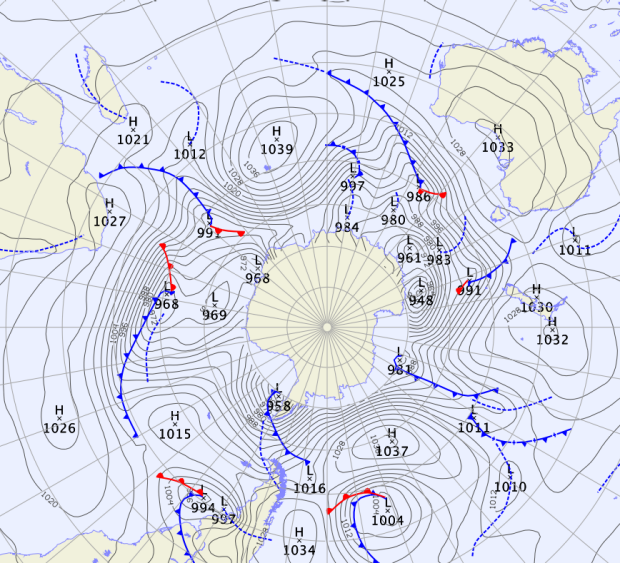 You know that these storms are more frequent and stronger during the austral winter. It’s not a bug from weather models ! There are some famous sail races around the globe which cross these regions, but only during the austral summer. Same for the ships which bring supplies to research stations in Antarctica. Even in the good season the roaring forties and the furious fifties are very tough for sailors. The Bureau of Meteorology of Australia (BOM) provide analysis and forecast for these regions. I lived in New Zealand for one year and I can tell you they know about those storms... Winds up to 120 km/h is common in new-zealand and the local met office often issues storm watches and advisories. The term "cyclone" alone or "hurricane" or "typhoon" is not to be used there because they are front related storms, like the winter storms in Europe (but turning clockwise in the southern hemisphere). When a warm air mass from the tropics and a cold air from the pole start to swirl, an extra tropical storm or extra tropical cyclone is born. Hurricanes, typhoons or (tropical) cyclone (all the same thing) are formed within the same tropical air mass and are not front related.